More than 20 states and a number of municipalities will be increasing the minimum wage just before or on New Year’s Day 2019, including recent statewide increases approved by voters in Arkansas and Missouri. Voters in both states turned out Nov. 6 in record numbers to raise the minimum wage, and other states have already approved graduated increases scheduled to go into effect with the turn of the calendar year. In Missouri, “Proposition B: The $12 Minimum Wage Initiative” passed and the hourly wage in the state will increase from $7.85 to $8.60 on Jan. 1. It will gradually increase by 85 cents per year until it reaches $12 per hour in 2023. The federal minimum wage, which remains the standard in 21 states, has remained at $7.25 an hour since 2009. On Election Day in Arkansas, voters approved Issue 5, a ballot measure that gradually increases the state’s minimum wage to $11 an hour by 2021. On Jan. 1, about 300,000 Arkansas workers will see the minimum wage rise from $8.50 an hour to $9.25. 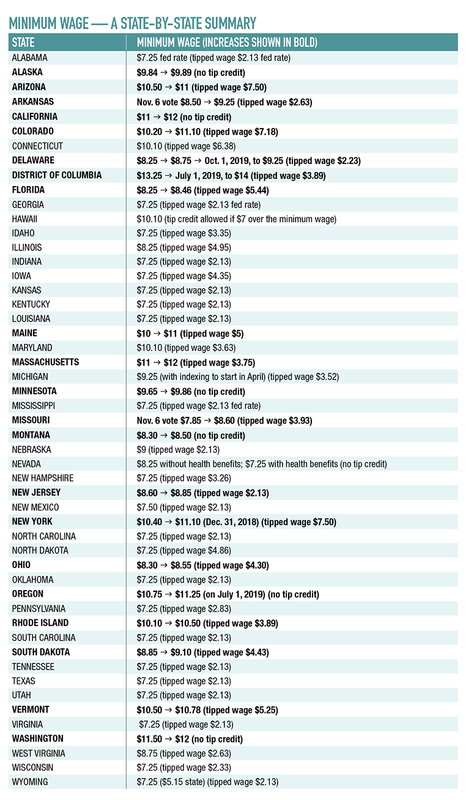 Minimum wages are less of a flash point than they once were, observers say, and many states have passed laws that chart out gradual increases or tie minimum-wage hikes to an inflation measure such as the Consumer Price Index. See the accompanying chart for a state-by-state rundown on increases for 2019. “By and large, depending on where you are, the scarcity of workers is putting more pressure on wages than politicians are,” said Joe Kefauver, managing partner at Align Public Strategies, a public affairs and communications firm, noting that the business communities in Arkansas and Missouri did not gird heavily for the November ballot initiatives. Pressure from advocacy groups to raise minimum wages at local and state levels has impacted the conversation, he noted. Kefauver said he is keeping his eye on legislation that may affect the tip credits in various states and localities. District of Columbia voters in June, for example, approved Initiative 77, which called for increasing the tipped minimum wage. But in votes Oct. 2 and Oct. 16, the D.C. City Council overturned the initiative in an 8-5 vote and retained the tipped minimum wage at $3.89 an hour, which was part of a graduated increase approved two years ago. On July 1, 2019, employers will need to pay such workers $4.45 per hour, and on July 1, 2020, the tipped minimum wage will rise to $5 per hour. Some commerce groups, such as Business for a Fair Minimum Wage, supported raising the minimum wages in November’s Arkansas and Missouri initiatives. In Arkansas, Capi Peck, owner of Trio’s Restaurant in Little Rock, said the higher wage had helped reduce turnover. “Our low turnover is invaluable from a bottom-line and customer-service perspective,” Peck said.